I finally finished this fellow for a special collector in Wisconsin. He had seen Santa's Little Helper and Jingles at the show in Schaumburg, but they had already been adopted. I told him I could make something similar but not the same. There are two reasons for that. First, the other set was sold as one-of-a-kind. Second, the reason I described it as one of a kind, is that I knew I had purchased those fabrics some time ago and would not be able to find them again. So he's not really a new design, but he is a new bear! I hope Jeff likes him. Ellen Borggreve Design and Kim Basta of Wild Thyme Originals. Thank you!! So if I understand the game right, I am to list five random things about me and then to tag five other bloggers. 1. I am listening to George Winston's December CD and I love it. I always think that musicians possess I kind of magic that I wish I had as well. This piano CD certainly is magical. 2. I have three brothers and no sisters. I do have four lovely sisters-in-law, though including Sean's brothers wife, and soon there will be five! 3. I have known my husband Sean for more than half of my life and I am still totally infatuated with him! 5. I do not like the taste of coffee--or even coffee flavored sweets, but I love the smell of it. I am going to copy the rules of this game here and tag five more bloggers. Please visit these lovely artists' blogs. I love to pop in on these folks! There's nothing like quality time with the family during the holidays! 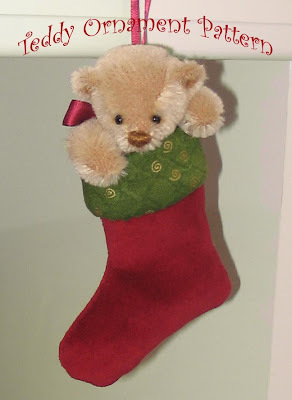 I created this Teddy Bear Ornament pattern to make a special gift for a friend and to use with the 2nd Annual Teddy Talk Christmas Ornament Exchange. 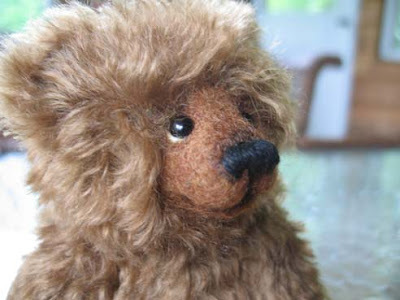 I made three of these and enjoyed it so much I thought it would be great to give a gift to ALL of my online Teddy Bear friends. 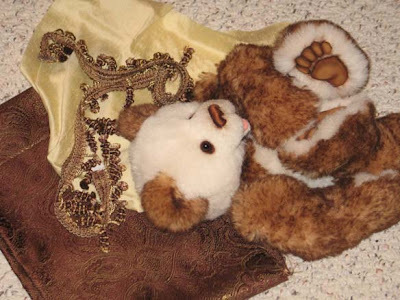 So here is the pattern!It is quite simple, but the directions assume that you have some experience making Teddy Bears or stuffed animals. Merry Christmas, My Friends! I am ususally one of those people that cannot wait for December 1 to arrive so I can start decorating my home for Christmas, but I got a bit of a late start this year. When I started moving the furniture to make room for the tree, I decided I needed to paint my living room before putting up the tree. I watch too many decorating shows on HGTV where a room is transformed from blah to beautiful in a day (and in just the span of an hour on the show! )What I needed to think about was the fact that there are always 5-8 people working on those transformations! "This room will be easy to paint," I told my husband. 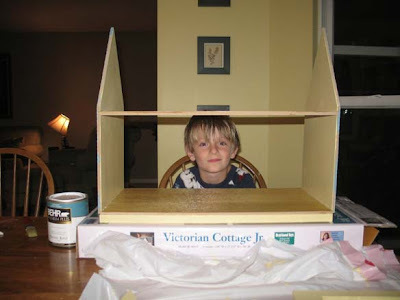 "We'll paint the walls today together and I'll do the trim tomorrow." One thing I have learned, but which I somehow always need to be reminded of is that things ALWAYS take longer than you think they will. 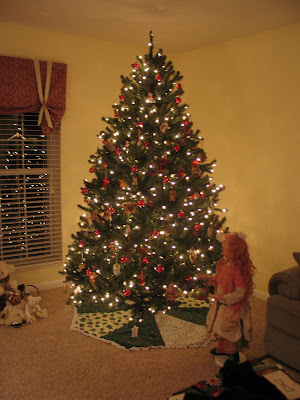 It is finished now and the tree is up. 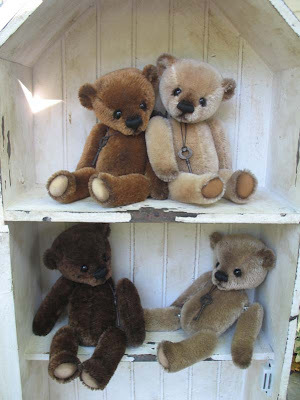 I still have more decorating to do, but for now I have to get back to work on my bears! Here are some decorating photos so far. Our Tree--haven't located the angel yet! Teddy Bears are always part of the decor. 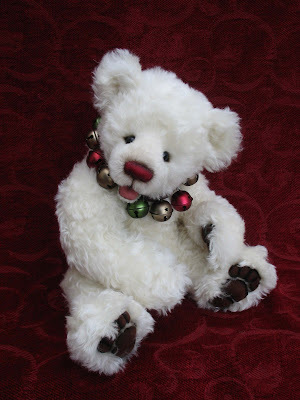 Figaro poses with two other cream colored bears in the soft glow of the tree lights. 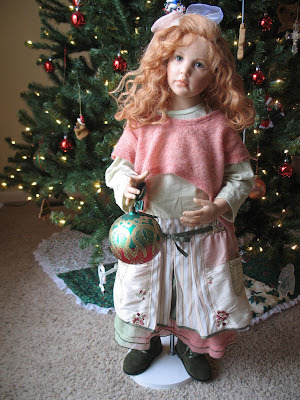 Rebecca, a Hildegard Gunzel doll, and a Christmas present from my husband, helps to put up the decorations. Back to bears, but more decorations to come! Again, quite a length of time has past since my last post. But not for lack of things to write about! I've been very busy! I had the most wonderful summer and I had wanted to post about my vacation, but now as my fingers and toes feel the chill of the house in the late fall, it doesn't seem appropriate. I have had a wonderful start to my first year as an art teacher. The students are great as are my fellow teachers. Some days, when I am cleaning the classroom at the end of a creative and satisfying day, a ripple of excitement runs through me as I think "I'm the art teacher." Of course, my years as a regular classroom teahcer were rewarding, too, but the delight I feel in sharing my greatest passion is unsurpassable. I also enjoy having all the different age groups. 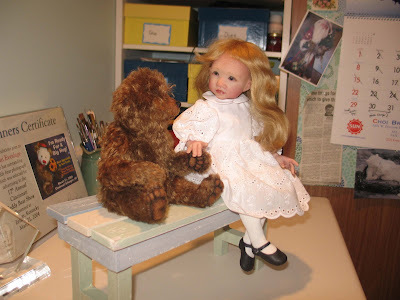 In addition to teaching, I had been working on bears and dolls for the ABC Productions show in Schaumburg. It was a lot of fun as usual and it went very well. Here is my table at the start of the show. Here are a few individual shots of some of the pieces. 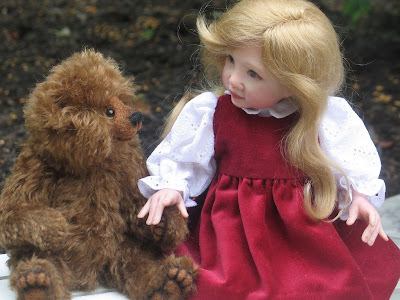 I have finished my latest doll and bear set!I love them!Of course, I always find things in my work which I can improve upon for next time, but still, I am very pleased with the way this one turned out. Here are a few more in progress photos before I show the ones of the finished piece. I made an under-dress with some eyelet fabric and I altered a pair of doll tights it fit her. They are ribbed so the seams in the back really do not show,and I'm glad of that. I cut the bottoms off and tucked them into the tops of her shoes with a thin bead of glue. I learned this little trick from Jack Johnston. In this photo her mohair wig is only resting on her head. It is much easier to keep the hairstyle nice if you attach the hair after the cloths are on. Goldie has her red velveteen jumper on and she's wondering if she can please have some hair now. 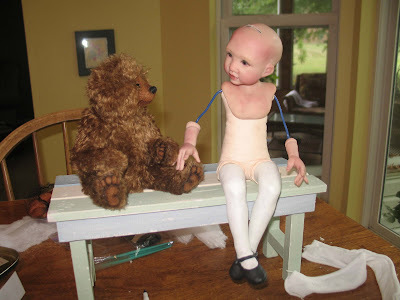 Baby bear looks lovingly on--he thinks she's beautiful the way she is! 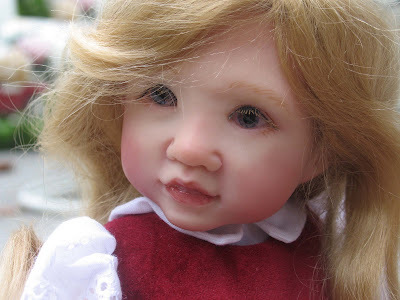 The clothing is sewn on because this is an art doll and she's not mean't to be dressed and undressed. Here is the finished set. I'm calling it "Friends Forever (Goldilocks and Baby Bear)"
That's all for now. 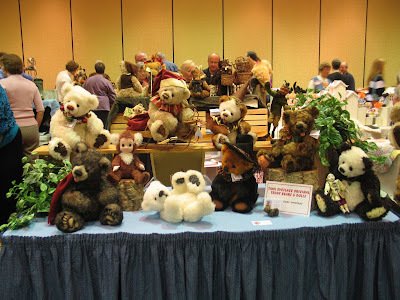 I only have four more work days until The Sauder Village Doll and Teddy Bear show so I'd better get off of the computer and get busy sewing more bears~! 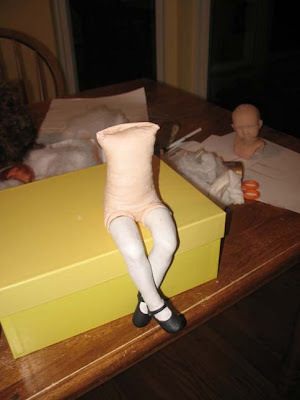 In Susanna Oroyanne's book Designing the Doll, she describes dollmaking as a series of problem solving activities. When the artist comes up with the idea, he or she then has to ask questions about how to achieve each element of the design, and how to bring those elements together as a whole. I love making a plan and having it come to fruition just the way I imagined it. When I made the Christopher Robin and Pooh piece I had a very clear picture of what I wanted to do (probably because the image is straight from the illustrations of E.H. Shepard). I knew just how I wanted them to appear--like they were stepping right out of the book. 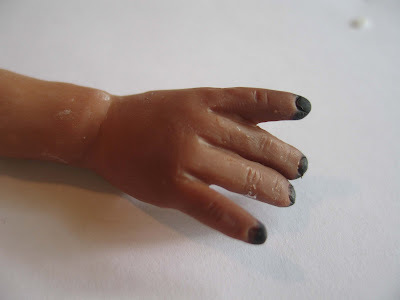 I tried to think of a new plan, but only got as far as "just a little girl with a doll or something". 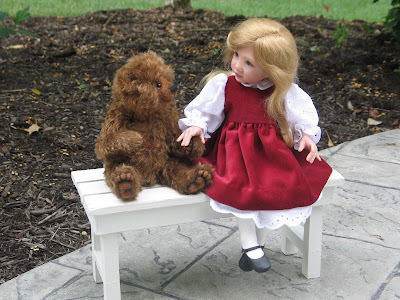 I went ahead and sculpted her legs,and ordered two mohair wigs from Dollsamore.com because I couldn't decide between the red hair with braids or the long wavy blond. This picture shows the leg armature I made from wire,foil and white floral tape. Here are the sculpted painted legs on the cloth body. I sculpted the shoes, too. 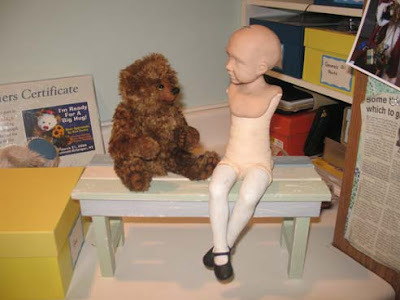 Well, yesterday the wigs came and as I worked on the doll's body and tried on the wigs (or rather the doll did), I saw the little bear watching. Then I had a thought!!! 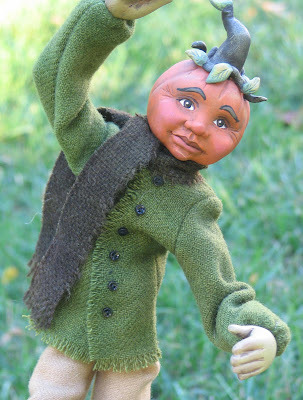 I know who this doll is! I'm making Goldilocks and Baby Bear!! Yes,I know, it's a common theme, but my Goldilocks and Baby Bear will be friends!! Arent they perfect for each other? I can't wait to see where the rest of this goes! 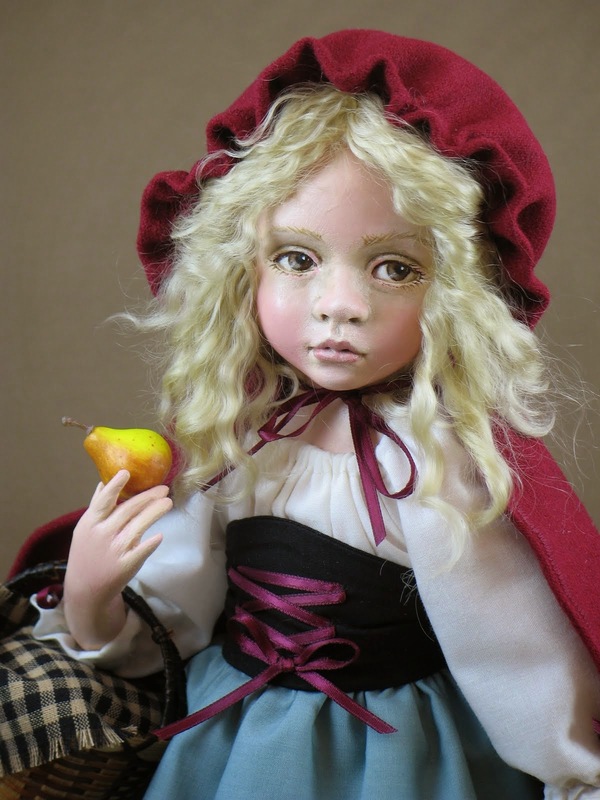 Anyway, in my doll artist guild, I discovered another that I liked really well. I like it so much because it's clever and it refers to something I have a lot of--- UFOs! It stands for unfinished objects! I always have several projects going at once so there are always UFOs invading my house. 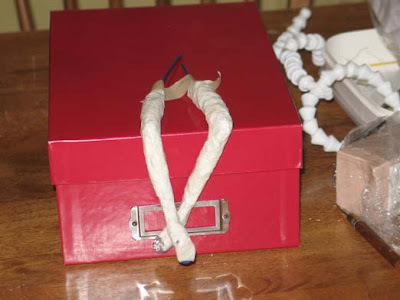 Sometimes these UFOs get put into boxes because I have decided to move on to something else, but often I move from one to the other for several weeks until they are finished. That's always really cool because when they all are finished around the same time, I feel like I have done a lot really fast even though that's not what actually happened. I think I'm coming up on one of these times soon here--I hope so anyway! 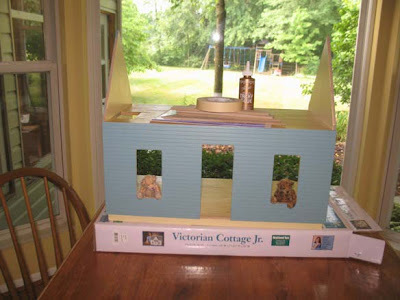 Can you see the little bears in the windows? I made these for Alex and Brendan a few years ago. It's "under roof" as the builders in my neighborhood would say. The bears have already moved in. 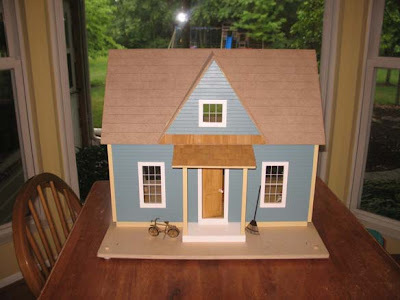 We just have to finish shingling and make some furniture. No longer UFO's--the finished Floppies! 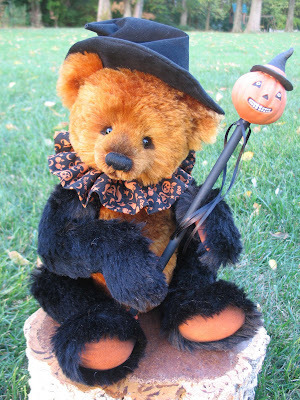 Here is a clown bear I am working on for a challenge on Teddy Talk. You can see he is nearly complete. 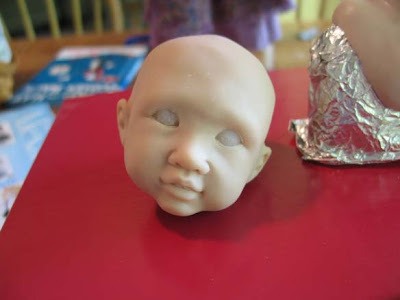 And finally, here is a doll I just started sculpting in polymer clay today. 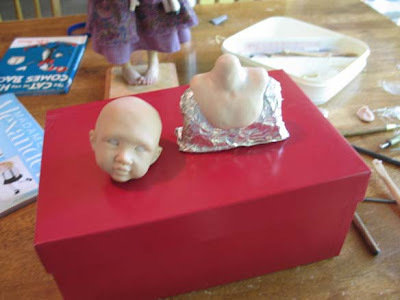 Her head is finished and baked and I am working on the breastplate. Well, that's about it... I'll post as I finish things. It has been a while. Gee, I'd better dust off the cobwebs and find some room to write here! I enjoy writing, and I had really wanted to keep this spot up to date regarding my creative activities. It's not that I haven't been creative, I've just been too busy to stop and make note of it. I started graduate school in January. 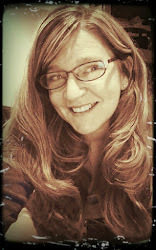 I renewed my K-8 teaching certification and hope to add Visual Arts certification to it. It was a fun and busy semester. I always enjoy school. I took a drawing class (Drawing II--the continuation of a class I took during my undergraduate study in 1990!!!) I enjoyed this class not only for the drawing, but mostly for the energy that comes from being surrounded by creative people. I loved how different the drawings all were even though we would start with the same subject matter and materials. Here is one of my drawings. We took a photograph of someone and made a skewed grid to warp the face. I warped my son Alex. He thought this was pretty cool. Since I was renewing my teaching certification, I also had a chance to be creative with a bulletin board assignment. 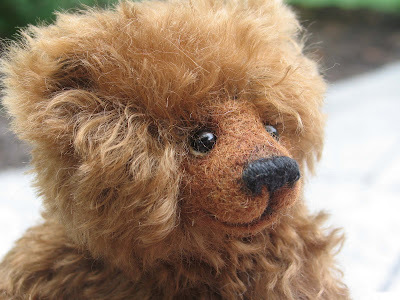 I did manage to squeeze in some bear making time in order to participate in the Bid 4 Bears Artist Campaign. 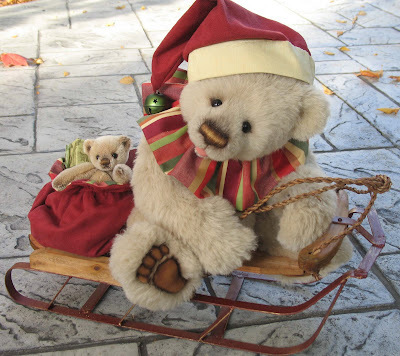 One of the bears I created for this, Honeypaws, became the star of my very first PowerPoint Presentation The Art of the Teddy Bear. This was an assignment for a class as well. 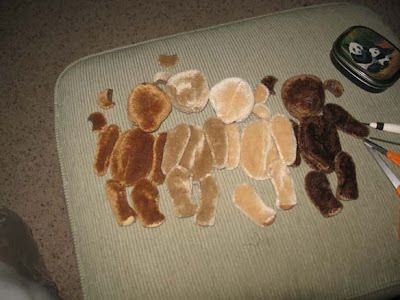 The presentation tells a bit of art history, and describes the process I go through to create my Teddy Bears. I presented the Slideshow to a Mother Daughter Banquet with a Teddy Bear Picnic theme. Here is Honeypaws. He is living in England now. What makes me feel like an artist? Anyway, what makes me feel like an artist is the creating. It is the starting with a blank piece of paper and filling it with images from my head (or even ones I observe), the taking of a shapeless ball of wool and poking it with a needle until the bear in my minds eye emerges, the sculpting a block of clay into a little face no one has ever seen before, and of course the turning of mohair yardage into the "cuddle-able" visions from my head. And when I think of the term "successful artist", I differentiate it from financial success. (In fact it bothers me that our society in general views successful people as wealthy people. There are certainly a lot of other ways to be successful in one's life.) I feel like whenever I succeed in creating something that makes me happy, or moves other people in some way, or communicates a feeling I wanted to express, then I am a successful artist. I have always felt this way. 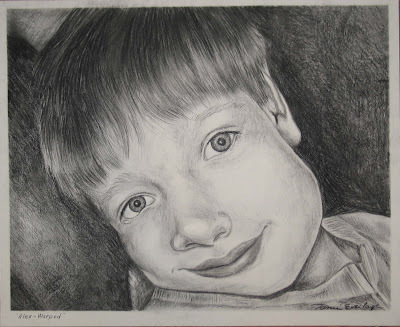 As a child, I loved to draw all the time, and often other children, teachers, relatives etc. 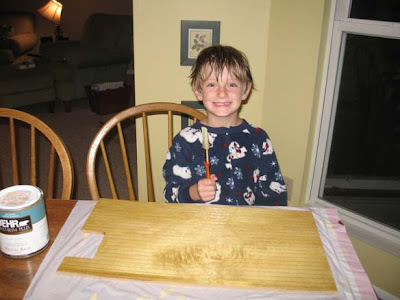 would ask "Are you going to be an artist when you grow up?" To which I would reply, "I am an artist already." Not that I possessed any special skills or talents at the time,or because my artwork had any value to anyone other than myself, but because I was creating, and that's what artists do. I read a quote recently and I plan to post it in my classroom when I am teaching art. People are often surprised at all the things I can make, I make Teddy Bears, dolls, scrapbooks, watercolor paintings, and more, but what I am the best at, is making a mess! At least I used to be. (Who am I kidding? I still am, I just know how to clean it up now!) 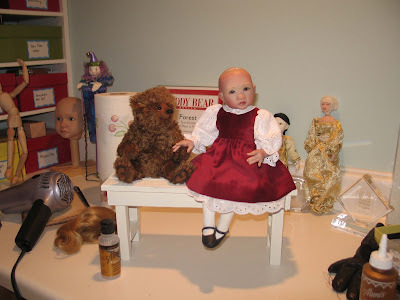 My workroom would become so “unbearably” messy that even I couldn’t stand it anymore, and I’d try to clean it up. It always seemed an impossible task. The room was a nice size to work in, but there was no place to put anything away. 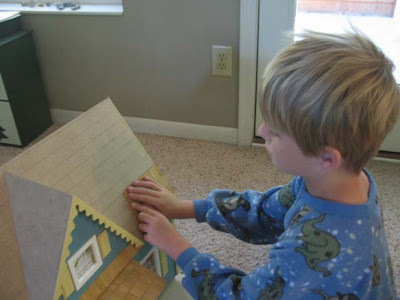 I kept boxes on top of and under my work table, mohair in both of my children’s closets, and stuffing in the basement. “I just need a place for my stuff.” I kept telling my husband. Well now I have one! We turned this small space into an office for my husband and moved my studio downstairs. Here are before and after pictures of my workroom!